Much has been said over the years about the term multiculturalism since it became a buzzword in the 1970’s. 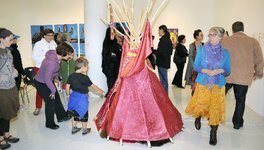 Since Culture Days began in 2010, SaskCulture has hired artists from various disciplines to travel across the province to contact local community planners, libraries, museums and artists to help brainstorm ideas & build community support for Culture Days. Museums. Art galleries. Historic sites. These three places are common sites on many cultural tours. In Saskatoon, leisure centres, government offices and food stores are the sites to discover instead.